A graceful typically multi-trunked tree with beautiful cinnamon brown exfoliating bark. Leaves are glossy bluish-green turning yellow in fall. A river bottom species with wide environmental tolerances that withstands wet or dry soils. Avoid alkaline sites. 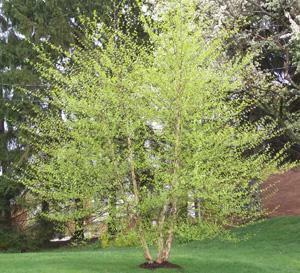 Bronze Birch Borer resistant. An excellent specimen or naturalizing plant. Our seed strain has great bark color producing high quality plants year after year.We receive many compliments from our customers.